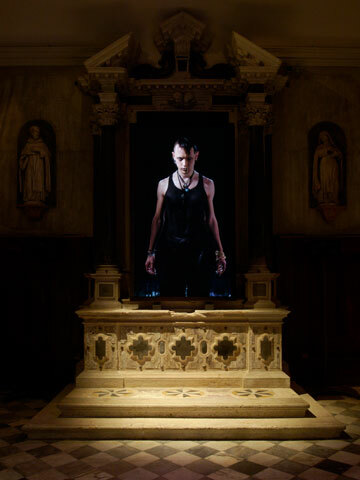 First displayed in the deconsecrated church of San Gallo during the 2007 Biennale of World Art held in Venice, Italy, Ocean Without A Shore is comprised of over 240 minutes of high-definition content displayed on 65″ and 103″ plasma displays. The work is displayed in a fully synchronous yet constantly evolving format, as individuals continuously transition through a remarkable world of Viola’s creation. AME was proud to have been involved through all aspects of the planning and implementation of this work, which has subsequently seen commissioning in Italy, Korea – and now can be seen on a daily basis at the Pennsylvania Academy of Fine Art in Philadelphia, PA.
Associates in Media Engineering has proudly provided media management, media finishing, storage and play out systems design and general technology consulting to the Bill Viola Studio since 2002.